If I learn anything at all this year, it will be the fact that sugar has a way of popping up when you least expect it. Take yesterday, for instance. After a morning of errands my husband Steve and I were looking forward to visiting one of our very favorite local restaurants: Steininger’s in Salem, New York. Steininger’s is one of those unassuming local places you can drive by a thousand times before you think to stop in, but once you do, you become a devoted fan for life. Walking in, you feel like you’ve perhaps entered a cozy lodge in the Austrian alps. The walls are covered with chintz and the air smells like a wonderful soup of the day, perhaps tomato parmesan or cream of mushroom. Real table cloths, fresh flowers, and paintings of European markets make you feel that you’re not in Kansas anymore. The back wall houses an impressive display of house-made chocolates: glass cabinets for the trays of truffles and caramels, and a heavy wooden cabinet showcases holiday chocolates in colored cellophane, all displayed with that uniquely European enthusiasm for celebrating with style. Easter was in full bloom at Steininger’s yesterday, with delicate chocolate eggs in baskets wrapped in seven different colors of decorative foil, along with a polite color-decoder sign to denote whether the dark green foil indicated a peanut-butter-chocolate egg or a marzipan one. Chocolate Easter bunnies were hard at work hauling chocolate baskets and chocolate wheelbarrows, (presumably back and forth from the chocolate mines at which they were enslaved by an exploitative chocolate overlord.) Needless to say, it was an unapologetic riot of sugar. The problem is, I love this stuff. I love holidays, I love special celebrations, I love special food and treats. I love making my kids follow rhyming clues all around the house to find their Easter baskets like a buried treasure at the end- and I’ll stay up till one AM to do it too. I don’t mind. But the display was so great, so totally up my alley, that I had to look away. Just not this year, I thought. And it’s only one year, I thought. Right? I decided to focus instead on Steininger’s six page menu, at least half of which is desserts. I knew that even if I wasn’t having creams puffs or pastry, I’d still get to have a delicious bratwurst with sauerkraut, mustard and potatoes. If anyone knows how to make a filling, satisfying meal, after all, it’s the Germans. Do I even need to tell you the next part? Or have we sung this song enough times by now? As always, I asked about the sugar content: of the sausages, the bread, the delicious smelling soup… and our waitress said yes, yes and … yes. All contained amounts, if sometimes only trace amounts, of sugar. I appreciated her honesty, her willingness to traipse back and forth from the kitchen to check multiple times- it would have been just as easy for her to appease me with an assurance that she wasn’t entirely sure of. For that matter, I’m sure I have been served restaurant food this year that has contained sugar simply because the waitstaff can’t or won’t check further, (ie: there’s no sugar in the soup, just chicken broth! But did anyone check the broth…?) But the rule I’ve decided to stick by is I have to ask. If they say there is no sugar, I trust them. If they say there is sugar, I have to find something else- “trace” amounts or no. So no sausages for me, and no soup. No bread either, which meant all sandwiches were off the table. All that remained was a vegetarian chef salad with fruit and nuts, and only if I dressed it with oil and vinegar, since the salad dressings all contained sugar too. Well, why was I so surprised? This has certainly happened enough times by now for me to anticipate. It’s just I’d been starting to assume that as long as I stayed away from “fast” or “chain” food it would be relatively easy to avoid sugar- this, however, blew that theory out of the water. Note to self: even “slow” food contains added sugar in strange and unusual places. That being said, we are talking about homemade food, and trace amounts of sugar (well, except for the cream puffs). I’m not wagging my finger at wonderful places like Steininger’s, just abiding by my own rules, which are admittedly overly strict because of the point I’m trying to make. What’s that point again? Oh yeah… eating without added sugar is way way way waaaaaaaaay harder than we think. 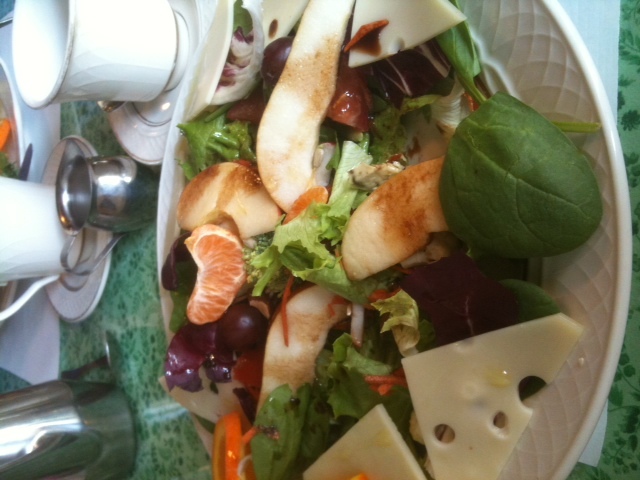 Anyway the salad was… actually delicious! You could’ve knocked me over with a feather. Who knew cheese, fruit and greens could satisfyingly take the place of hot soup on a chilly spring day? I mean, besides the Easter bunny. Ironic that wordpress displayed an ad for Cadbury chocolate eggs above your post. Even your words can’t escape sugar! You are currently reading A Year Of No Sugar: Post 38 at Eve O. Schaub.